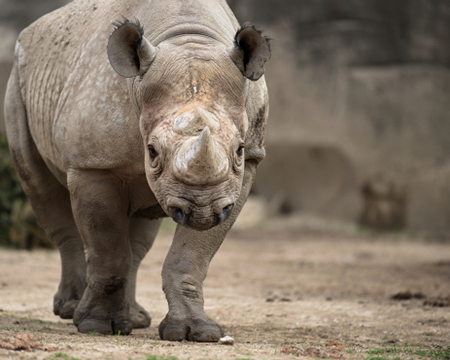 Researcher at the Universities of Liverpool and Manchester have monitored the hormone levels of female rhinos at Chester Zoo to discover the best time to introduce them to a potential partner. For ten years the zoo had no new baby rhinos, but since the start of the project they have now had four births in the last four years. Katie Edwards, PhD student from the University of Liverpool’s Institute of Integrative Biology, said: “Hormones associated with reproduction can be measured in an animal’s urine and faeces. Zoo keepers regularly bring dung samples from each of the female rhinos over to our lab for testing. We then break it down and extract hormonal indicators from it. The project was devised in 2007 by the Scientific Manager, Dr Sue Walker and Dr Susanne Shultz from the University of Manchester. Dr Sue Walker, Scientific Manager at Chester Zoo, said: “We established the project to try and understand the differences in reproductive success between individuals in the European zoo-based population of black rhinos – why do some individuals breed well, while others do not? “The idea is that with a better understanding of reproduction, we can help to improve the breeding programme for this critically endangered species. The team is now working with zoos throughout Europe and say that their methods could support the success of captive breeding programmes for this critically endangered species.